Though regular sessions of the Kentucky General Assembly are yearly events, in many ways each one signals a fresh start. 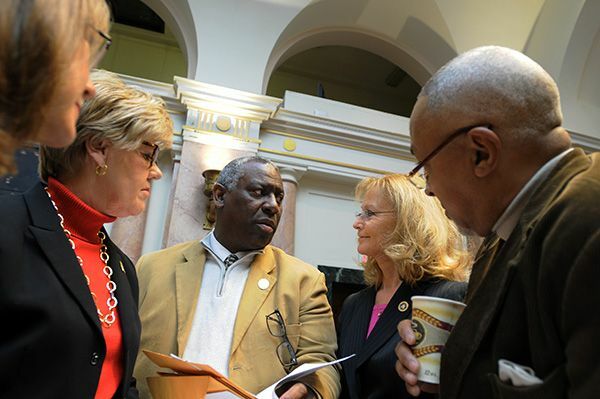 (From left) Rep. Kelly Flood, D-Lexington, Rep. Rita Smart, D-Richmond, Rep. Derrick Graham, D-Frankfort, Rep. Martha Jane King, D-Lewisburg, and Rep. Arnold Simpson, D-Covington, discuss legislation in the Kentucky House of Representatives. The beginning of the session also started anew the journey that scores of bills will follow towards becoming state law. The starting line is the same for all bills: introduction in a legislative chamber. That starting line was a crowded place this week with more than 200 bills filed in the Senate and House combined. Political observers often pay particularly close attention to the first few bills filed in the House and Senate – a good sign of measures are top priorities of chamber leaders. In the House, a proposed constitutional amendment that would allow local-option sales taxes was filed as House Bill 1. The measure would let voters to decide on a constitutional amendment to help permit communities to implement a temporary sales tax of a penny or less to raise money for a specific project. At the other end of the Capitol, Senate Bill 1 got off to a fast start by earning approval of the Senate during the first week of the session. The measure would make Kentucky a right-to work state, meaning that people could work at unionized shops without paying dues to an organized labor group. Supporters argue that right-to-work states have a strong edge in job creation while opponents question the quality of life in right-to-work states. SB 1 now goes to the House for consideration. 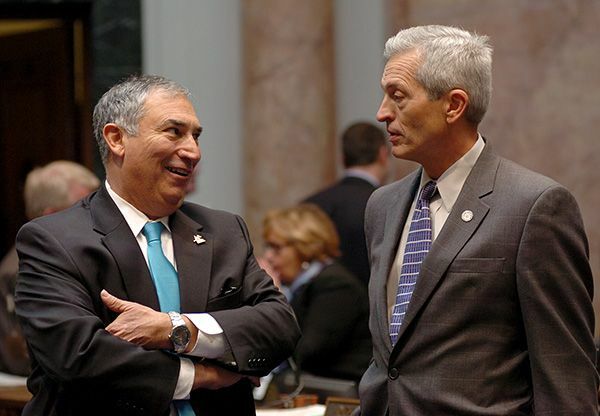 Rep. Sal Santoro, R-Florence (left), speaks with Rep. Jerry Miller, R-Louisville, prior to the start of the day's legislative session in the Kentucky House of Representatives. Although numerous bills started moving through the legislative process this week, there was also much attention on what’s known as the “organizational” work that takes place in the first week of odd-year sessions. Committee assignments were made, rules of procedure were adopted and chamber leaders were selected. There was a mix of both change and continuity in leadership elections. The top leaders in both the Senate and House remain the same with this week’s re-election of Senate President Robert Stivers and House Speaker Greg Stumbo to their leadership posts. But there were changes in each chamber’s “pro tem” positions – the leadership spot with duties to preside when a chamber’s top leader is absent or unavailable. Sen. David Givens, R-Greensburg, was selected as Senate President Pro Tempore. Rep. Jody Richards, D-Bowling Green, -- a former House Speaker – was chosen to serve as House Speaker Pro Tempore. Democratic and Republican caucuses also announced their leadership lineups in each chamber. 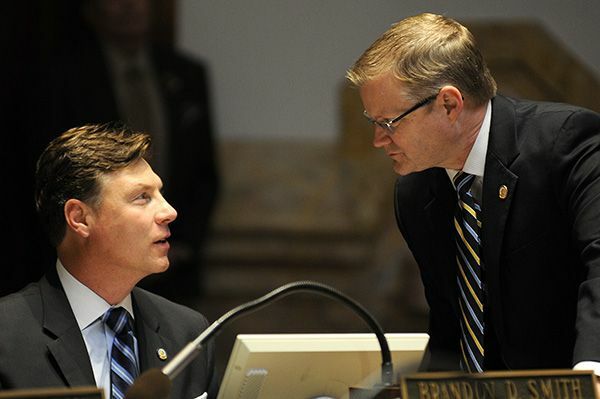 Senate Majority Floor Leader Damon Thayer, R-Georgetown (right), talks with Sen. Brandon Smith, R-Hazard, during a recess period in the Kentucky Senate. In the Senate, leaders are: Majority Floor Leader Damon Thayer of Georgetown; Minority Floor Leader Ray Jones of Pikeville; Majority Caucus Chair Dan Seum of Louisville; Minority Caucus Chair Gerald Neal; Majority Whip Jimmy Higdon and Minority Whip Julian Carroll. The House lineup includes: Majority Floor Leader Rocky Adkins of Sandy Hook, Minority Floor Leader Jeffrey Hoover of Jamestown; Majority Caucus Chair Sannie Overly of Paris; Minority Caucus Chair Stan Lee of Lexington; Majority Whip Johnny Bell of Glasgow; and Minority Whip Jim DeCesare of Bowling Green. 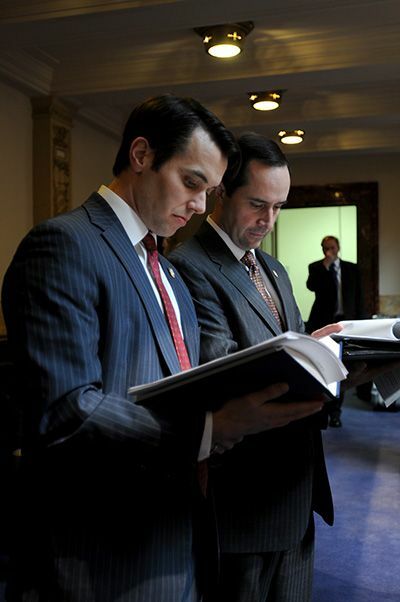 Sen. Morgan McGarvey, D-Louisville (left), studies legislation with Sen. Christian McDaniel, R-Taylor Mill, prior to the start of the legislative session in the Kentucky Senate. The governor outlined his goals for the legislative session in his speech, just as numerous lawmakers have in talks throughout the state and in meetings and interviews since they returned to Frankfort this week. One issue all seem to be talking about is the toll heroin is taking on Kentuckians. Members of both the House and Senate have looked at approaches in dealing with this issue, with one approach already put into the form of legislation approved in a legislative chamber during the first week of the session. 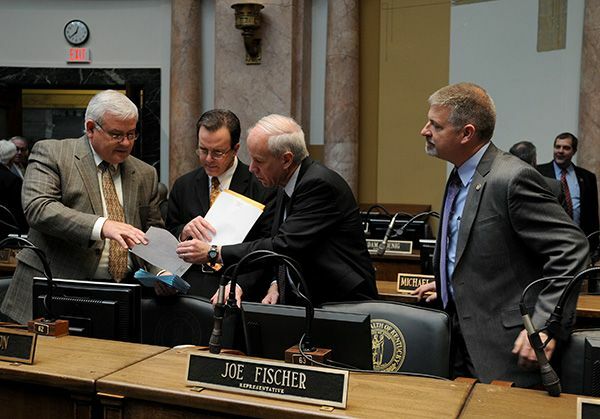 (From left) Reps. Phil Moffett, R-Louisville, Mike Harmon, R-Danville, Joseph Fischer, R-Ft. Thomas, and Jim DuPlessis, R-Elizabethtown, review legislation in the Kentucky House of Representatives. SB 5, approved by the Senate, calls for stronger punishments for heroin dealers as well as better support for treatment programs. The bill also provides for administration of naloxone, a medication used to counter the effects of an overdose, by first responders and provides immunity for those individuals and their employers when the drug is administered. The legislation now goes to the House for consideration. Now that lawmakers have closed out the first week of the session, they are scheduled to return to the Capitol on Feb. 3. That makes this an important time for citizens to stay in touch with lawmakers and share their views on the issues lawmakers will be voting on during the remainder of the session. There are several easy ways citizens can stay in touch with the General Assembly. Top photo: Sen. Mike Wilson, R-Bowling Green (right), congratulates Sen. Christian McDaniel, R-Taylor Mill, after the Kentucky Senate unanimously approved an anti-heroin bill McDaniel sponsored.